eInfochips will demonstrate its Snapbricks™ Intelligent IoT Gateway, a software framework that enables multi-platform edge to cloud solutions, at booth #7 in IoTNext 2017, Nov 8-9 in Park Plaza, Bangalore, India. eInfochips, a global product engineering services firm, will demonstrate the capabilities of its Snapbricks (TM) intelligent IoT gateway framework at booth #7 in IoTNext 2017, Nov 8-9 in Bangalore, India. The framework, launched earlier in the year at IoT World 2017 conference, can now also act as an Application Enablement Platform (AEP) with mesh management capabilities, and provides support for multiple cloud platforms like AWS Greengrass, Azure IoT Hub, SAP Leonardo Live, and more. The company will also sponsor and contribute to the panel discussion on the solutions and best practices to improve security in the IoT value chain. IoTNext 2017, one of the major events in India for IoT leaders, practitioners and ecosystem enablers, is expected to host around 1000+ delegates across the world. Themed “Beyond the Hype: Pilots to Scale”, IoTNext 2017 will focus on the opportunities and challenges from practitioners' viewpoint, learning from the pilots and challenges in terms of full scale deployment. Interact with the IoT experts from eInfochips at IoTNext. Book a time slot for a demo on Snapbricks IoT gateway framework. Contact the Snapbricks team today for a free consultation. 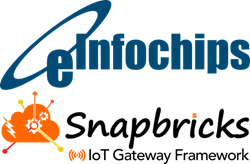 eInfochips is a product engineering and software R&D services company with over 20 years of experience, 500+ product developments, and over 40M+ deployments in 140 countries across the world. Today, 60% of its revenues come from Fortune 500 companies and 80% from solutions around connected devices. From silicon to embedded systems to software, from design & development to deployment & sustenance, eInfochips maps the product journey of its customers. The company has the expertise and experience to deliver complex, critical, and connected products across multiple domains, for projects as small as a one-time app development to a complete turnkey product design. With its R&D centers in the USA and India, eInfochips continuously invest and fuel innovations in the areas of Product Engineering, Device Lifecycle Management, IoT & Cloud Frameworks, Intelligent Automation, and Video Management. The company has sales presence in the USA, Japan, and India.